BIG SALE!! 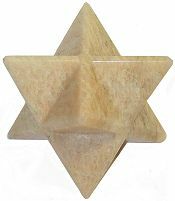 GEMSTONE MERKABA STARS BIG SALE!! 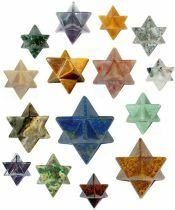 Exquisite large 8-Pointed Gemstone Merkaba Star Carvings in 18 new premium stones. Also known as Star Tetrahedron, 3D Star of David and Flower of Life, Mer-Ka-Ba means Light-Spirit-Body in ancient Egyptian and Chariot in the Book of Ezekiel. 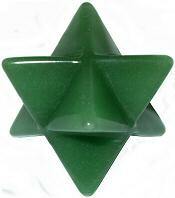 Carved Merkaba Star in beautifully polished AA quality Green Moss Agate. Moss Agate is a green stone containing inclusions of minerals resembling moss or foliage with translucent colorful inclusions. Moss Agate leads one towards agreeability, strength in endeavors and efficacy in one's pursuits and has wonderful grounding qualities. Mer-Ka-Ba means Light-Spirit-Body in ancient Egyptian and Chariot in the Book of Ezekiel. 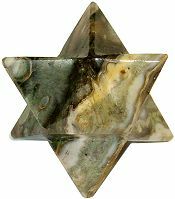 Exquisitely beautiful Tree Agate Merkaba Star carvings have a translucent variegated creamy white background with fractal like green crystal formations. Also known as Dendritic Agate, Crystal masters use Tree Agate to refresh the senses and reinvigorate the joy of the moment in daily life. Gorgeous, hand carved and polished Amazonite Merkaba Star carvings from India have a shimmering aquamarine blue "Sea Glass" shine. Amazonite is a blue/green variety of a Feldspar called Microcline. All Feldspars have soothing and calming qualities. Amazonite, in particular, fosters a deep clarity and an instinctive harmonizing which nurtures feelings of love and well-being. 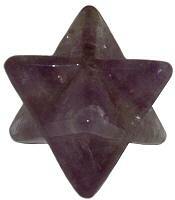 8-Pointed Amethyst Merkaba Crystal also known as Star Tetrahedron and Flower of Life in beautifully polished Amethyst. Amethyst promotes loyalty and devotion as well as being known historically to foster sobriety. Mer-Ka-Ba means Light-Spirit-Body in ancient Egyptian and Chariot in the Book of Ezekiel. 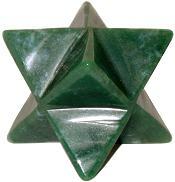 8-Pointed Aventurine Merkaba Star Carving in two sizes!. Aventurine fosters integration of the emotions, enhancing creativity, clarity and augmenting the pioneering spirit. Mer-Ka-Ba means Light-Spirit-Body in ancient Egyptian and Chariot in the Book of Ezekiel. 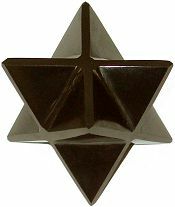 The Merkaba is the Sacred Geometry form for the Life energy that infuses living beings. 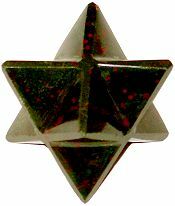 Rare India Bloodstone Merkaba carvings are now in stock and contain small "drops" of Red Jasper. In Crystal Lore Bloodstone, also known as Heliotrope, was considered a powerful healing stone and used by shaman and mystics for its grounding and balancing properties. 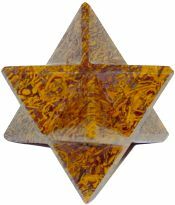 Eye popping Mariam or Calligraphy Stone Merkaba carvings have a mesmerizing collage of gold and burgundy crystalline formations. Named Calligraphy Stone in the West for the eye catching, intricate red swirls that resemble artistic scrolls. Called Sang E Mariam in the Middle East, this stone is found in the Holy Land as well as India and Persia. It's name means Mary's Stone and the legend is that Mary gave birth while laying on this rock. 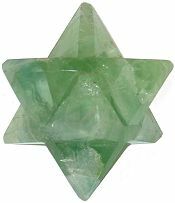 Unusual 2 1/2" Clear Green Fluorite Merkaba Star carvings. Named for the Latin verb 'fluere' meaning 'to flow', Fluorite has a cleansing, fluid quality used by crystal masters to clear both physical and mental energies which aids regeneration and clarity of thought. Mer-Ka-Ba means Light-Spirit-Body in ancient Egyptian and Chariot in the Book of Ezekiel. Mostly Purple Chinese Fluorite 2 1/2" Merkaba Star carvings have translucent honeycomb like crystals and clear banding in clear and deep purple hues. In crystal lore Fluorite plucks order from the heart of chaos, it provides a stabilizing energy which helps relationships and individuals to flourish. 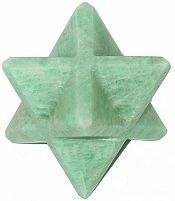 Carved Merkaba Star in luminous Emerald Fuchsite from India have deep emerald hues with luminous Mica crystals that sparkle. Emerald Fuchsite is believed to promote clarity of thought and discourage unhealthy thoughts and feelings. Mer-Ka-Ba means Light-Spirit-Body in ancient Egyptian and Chariot in the Book of Ezekiel. 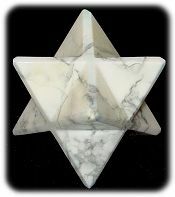 Hand carved and polished White Howlite Merkaba Star carvings. In crystal lore Howlite encourages healing by calming physically and emotionally. It dispels negativity and spurs ambition toward positive goals. 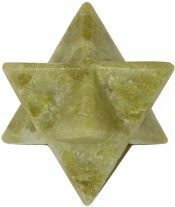 The Merkaba Crystal is a 3D Star of David that symbolically integrates Mer (LIGHT) with Ka (SPIRIT) and Ba (SOUL) making it an excellent meditation tool. 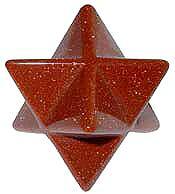 8-Pointed Merkaba Crystal also known as Star Tetrahedron and Flower of Life in beautifully polished Red Goldstone. 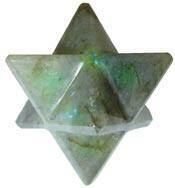 The Merkaba is the Sacred Geometry form for the Life energy that infuses living beings. The universal Life energy is also called Chi and Prana and many other names in ancient and modern cultures. Beautiful sparkling Red Goldstone has myriad gold flecks. 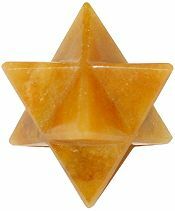 Amazing Golden Quartz Merkaba Carvings from India have a semi translucent gold hue. Gold Quartz has been called the "Golden Healer" by Melody and other Crystal Masters. 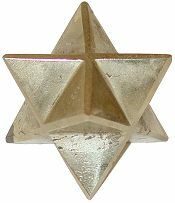 In Sacred Geometry the MerKaBa is the combination of two three sided pyramids creating a 3D Star of David which symbolizes the integration of Mind, Body and Soul. New Madagascar Ocean Jasper Merkaba carvings have colorful orbicular formations and quartz crystal inclusions which are always unique. Also known as Orbicular Jasper, it has been used by Crystal Masters for meditation and physical healing. 8-Pointed Merkaba also known as Star Tetrahedron and Flower of Life in beautifully polished Labradorite. Labradorite is a fiery Feldspar that facilitates change in trying circumstances, plumbing the strengths of the inner self. Quality AA Moonstone Merkaba carvings from India have a beautiful white to pale cream color with a translucent sparkling sheen and opalescence. Moonstone is an ancient, mysterious stone, connected to the Divine Feminine and the unseen spirit. It illuminates the inner self and strengthens intuition and the subconscious dream world. 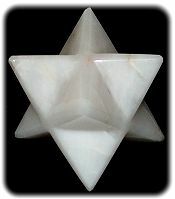 Fiery Rainbow Moonstone Merkaba Star carvings are hand made in India. Moonstone is a stone of new beginnings, it illuminates the inner self and strengthens intuition and the subconscious dream world. Rainbow Moonstone has flashes of blue and green fire known as adularescence. 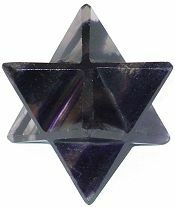 These Merkaba crystals have a white gray pearl like matrix with black tourmaline crystals and many areas of blue fire. 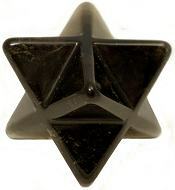 Black Obsidian 2 1/2" Merkaba Star Carvings. The power stone Black Obsidian has been used to banish grief and encourage happiness and good fortune. 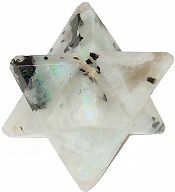 Merkaba crystals are excellent spiritual, metaphysical and meditation tools for mystical study of crystals and healing stones as well as for Feng Shui cures. 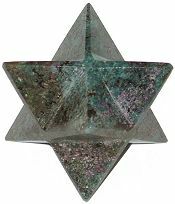 Stunning polished Iron Pyrite 2 1/2" Merkaba Star Carvings are a unique addition to any collection. In crystal lore Iron Pyrite is a potent protector, shielding one from intense negative energies while maintaining a positive and optimistic outlook. 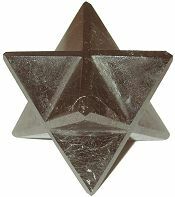 Iron Pyrite also known as Midnight Pyrite, is well known as fool's gold and these Merkaba carvings have a high shine metallic finish. 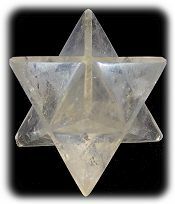 Large Clear Quartz Merkaba Star Carvings. Quartz magnifies Chi energy, the universal life force and returns one to the natural healing rhythms of daily life. Meditating or tuning in to the quartz crystal energy can cleanse and nourish the mind, emotions, and physical body. Rutilated Quartz Merkaba carvings are loaded with broad ribbon-like needles of Black Tourmaline. Tourmaline has historically been a stone of great spiritual value believed to repel and transmute negative energy and when combined with Quartz will magnify the healing and spiritual properties of the stone. 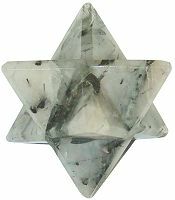 Rare Clear Smoky Quartz 8-Pointed Merkaba Crystal carving also known as Star Tetrahedron and Flower of Life. Smoky Quartz has a gentle yet intense clearing quality that penetrates and dissolves habitual negative thoughts and feelings which poison daily life. Mer-Ka-Ba means Light-Spirit-Body in ancient Egyptian and Chariot in the Book of Ezekiel. 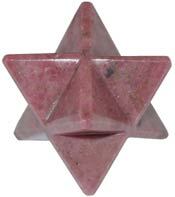 Beautifully polished Rhodonite 2 1/2" Merkaba Star Carvings. Rhodonite is said to balance the yin-yang energies and assist in the attainment of one's greatest potential. 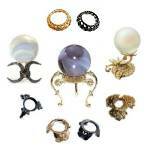 Use these for Feng Shui cures, hold during meditation or place on desk to tune in to the crystal energies. Rare large Madagascar Clear Rose Quartz 2 1/2" Merkaba Star Carvings. 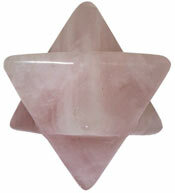 In crystal lore, Rose Quartz has a soothing, calming effect and is the traditional lover's stone. Mer-Ka-Ba means Light-Spirit-Body in ancient Egyptian. 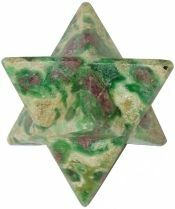 Rare Merkaba Star carvings in colorful Ruby Fuchsite. The Ruby crystals sparkle, surrounded by Blue Kyanite in a Green Fuchsite matrix. Kyanite holds no negative energy and is used to cleanse other crystals. Ruby encourages the search for one's Bliss and lights the darkness within the spirit. Fuchsite is said to increase the healing properties and flow of energy from other healing crystals. Hand carved Ruby Merkaba Stars from India are slightly intergrown with blue Kyanite crystals, this combination is also known as Ruby Kyanite. In Gem lore, Ruby is known as "The Stone of Nobility", it encourages the search for one's Bliss, protects from unhappiness and lights the darkness within the spirit. 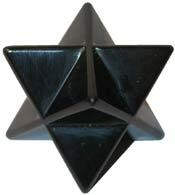 We have a limited quantity of Shungite Merkaba Star carvings in a satin leather like finish. Russians have used Shungite and Shungite waters for their powerful healing and purification properties since Peter 1st. Shungite is only found in Lake Onega, Russia and contains a unique conductive inorganic carbon with C60 Fullerene molecules in tight Bucky ball shapes. Fullerenes display mysterious quantum bi-location and molecular nano programming properties. Beautiful Snow Quartz Merkaba Carvings from India have excellent polish and color. Snow Quartz also called White quartz has a smooth, muted energy that is helpful in dissolving the victim mentality as well as processing a particularly difficult learning experience. 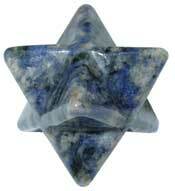 Sodalite 2 1/2" Merkaba Star Carvings. Sodalite promotes companionship and self-esteem, it unifies individuals towards a common purpose. 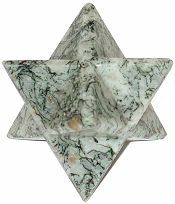 Merkaba Stars are excellent spiritual, metaphysical and meditation tools for mystical study of crystals and healing stones as well as for Feng Shui cures. Sunstone is known for it's iridescence and brilliant reflections. 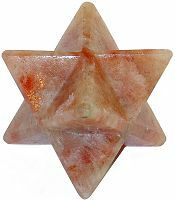 These A quality Sunstone Merkaba Stars from India have bright chatoyant orange and cream tones. In Crystal Lore Sunstone is used to increase vitality and alleviate stress. It can encourage individuality and bring good luck in games of chance. The Ancient Greeks believed Sunstone represented the sun god and brought life and prosperity to it's possessor. 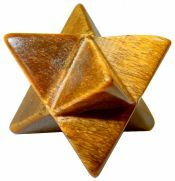 Exquisite large 8-Pointed Gemstone Merkaba Star Carvings in high quality chatoyant Tiger Eye. Tiger Eye exudes assertiveness and drive. It magnifies personal energies of desire, enthusiasm, vigor and action. 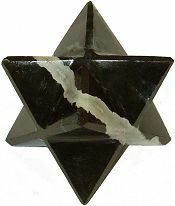 High quality 2 1/2" Black Tourmaline Merkaba Star carvings with a smooth polish are extremely rare! In crystal lore Black Tourmaline has powerful energies both repelling and protecting from negativity. It has been used to increase vitality and guard against depression. 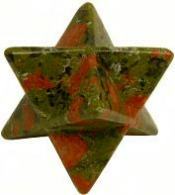 Our large Unakite 2 1/2" Merkaba Star Carvings are back in stock. Unakite is a crystallized form of pink Feldspar, green Epidote and Quartz. It is said to clear blockages to physical and personal growth and speed development of one's goals. Mer-Ka-Ba means Chariot in the Book of Ezekiel. 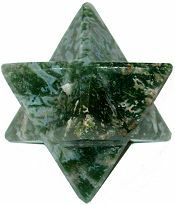 Rare Vesuvianite 2 1/2" Merkaba Star Carvings from India also known as Vasonite and Green Garnet have a light to deep Peridot green color with some intergrown quartz crystals and an attractive high polish finish. Green Garnet, used by Mayans, African Shaman and present day Crystal Masters, is considered a powerful "Sacred Stone", believed to extract negative energies on all levels and warm the heart. Amazing Fancy Black Agate Merkaba carvings from India have a glassy polish and very even black color. Black Agate is a protective power stone deflecting negative energy and attracting success and wealth. 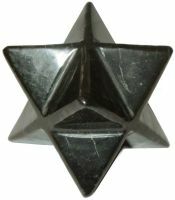 Beautifully polished and finished, hand carved 2 1/2" Black Agate Merkaba Stars from India. Stunning Clear Agate interspersed with Black Agate Merkaba carvings have asymmetrical banding and some translucent crystal formations within a solid black Agate matrix. In crystal lore clear Agate enhances mental perception and awakens inherent talents, while the Black Agate power stone attracts success and wealth and averts negativity. 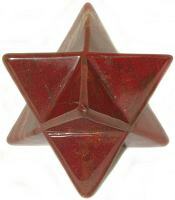 Red Jasper Merkaba Carving, also known as Star Tetrahedron and Flower of Life. Red Jasper is believed to be a stone of justice, assisting to rectify unjust circumstances. 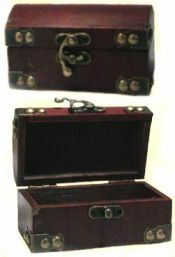 It is also used for protection. Mer-Ka-Ba means Light-Spirit-Body in ancient Egyptian. In essence it is the Sacred Geometry or form of Chi, Prana or the Life energy that infuses living beings and is referred to universally by ancient and modern cultures. 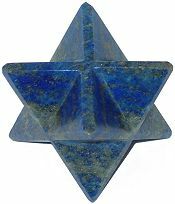 Sensational Lapis Merkaba Star Carvings with superb deep blue coloring. Lapis Lazuli was the revered stone of Ancient Egyptian King-Priests and Queen-Priestesses. It was said to exist before time was born and admit one to the sacred mysteries. 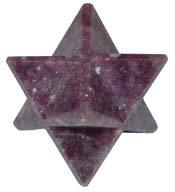 Large 2 1/2" Lepidolite Merkaba Carvings, also known as Star Tetrahedron and Flower of Life. Lepidolite is an unusual Mica silicate with heavy Lithium deposits which create the lavender to violet hues. It is said to have an uplifting effect on mood that is helpful with shedding addictive, dependent and compulsive behavior.